The Brondell H2O+ Water Pitcher Filter Cartridge outperforms the top competition in four out of five tests. The advanced 4-stage water filter dramatically reduces harmful heavy metals like Cadmium and Copper along with Aesthetic Chlorine, bad tastes and odours, making it safe and healthier for the whole family. Choose Brondell H2O+ for better water. Helps reduce minerals released in the air caused by hard water. HAF-CIN/EXP Replacement Water and Ice Filter for Samsung Refrigerator (2-Pack) Fridge Filterz FFSS-375-2 cyst filter (Standard 42 & 53) 2 Pack replacement water filter is designed to fit selected Samsung* refrigerators. This premium water filter is designed to remove sediment, Chlorine Taste and Odour as well as contaminants and heavy metals including Lead, Mercury, Lindane, 2-4-D, atrazine and benzene, to name a few, that may be present in your drinking water. 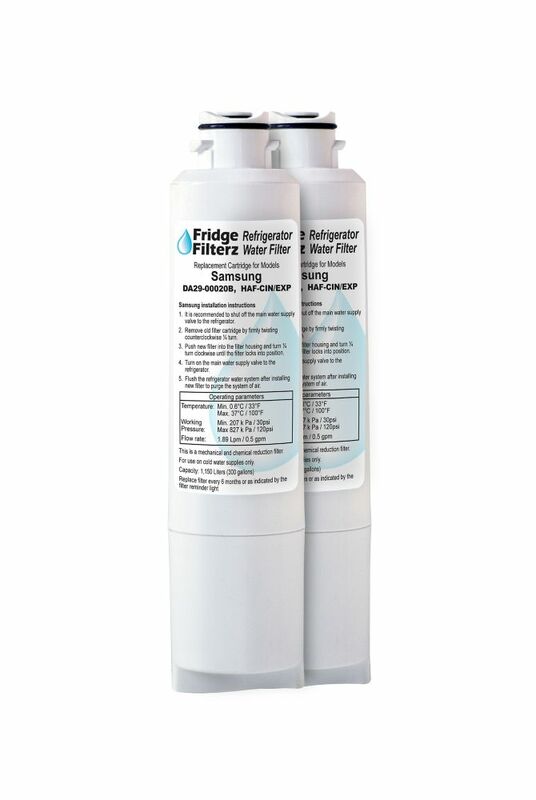 This refrigerator filter replaces: Samsung* Filter DA29-00020B, HAF-CIN/EXP. The FFSS-375-2 is tested to meet NSF/ANSI Standard 42 & 53, Particulate Class I, to ensure that you are getting a SAFE, quality product. Fridge Filterz are manufactured to the highest quality standard, providing you and your family with clean, fresh tasting, odour free ice and water without removing beneficial minerals and fluoride that may be present in your drinking water. All of our fridge filters are made with environmentally friendly (green) carbon. *Samsung is a registered trademark of Samsung Corporation. HAF-CIN/EXP Replacement Water and Ice Filter for Samsung Refrigerator (2-Pack) is rated 4.2 out of 5 by 23. Rated 5 out of 5 by Peter A from Not Samsung brand, but works fine! I bought this two pack to replace Samsung filters .. less expensive and seems to work just fine! Rated 5 out of 5 by Mary from Frig. water Filter I am very pleased that the replacement water filter for my samsung frig. was an awesome fit and works great. I will purchasing again. Rated 1 out of 5 by GodI7402 from Disgusting!! Really disappointed with this product! First 30 glasses tasted like pure Clorox bleach! I have a zero water filter tester that showed both the tap water and fridge water had the same levels. Really had to bleed the fridge for a few days just to get rid of the smell. Ordering a Samsung original! Rated 4 out of 5 by gdodu1292 from Easy to install and water flow slightly lower The filter fits well in the fridge pocket and has easy to follow installation instructions. Be aware about one major difference between the original Samsung filter and this one: Samsung filter does have two O-rings to seal filter into fridge pocket, the new one has only one O-ring. So far, no leaks but maybe it's to early to say. Will come back with a review in about 3 months. Water flow it's slightly lower compared to Samsung original filter., but these are not reasons not to buy it. Half the price to original Samsung filter with similar performances, it's worth to try it. Rated 5 out of 5 by Hip nana from Great price. Stocked up on replacement filters at a great price.